The Expedition 58 crew continued filming in virtual reality onboard the International Space Station today. The orbital residents also conducted behavior tests and eye checks throughout Thursday while preparing for the first U.S. commercial crew vehicle mission. NASA astronaut Anne McClain logged into specialized software for a test session with the Behavioral Core Measures study. The neuropsychological test measures cognition as an astronaut conducts simulated robotic activities on a laptop computer. Afterward, she joined Canadian Space Agency (CSA) astronaut David Saint-Jacques for eye checks in the Harmony module at the end of the day. The two swapped Crew Medical Officer roles and scanned each other’s eyes using optical tomography coherence gear. Both astronauts started the day with a standard vision test in the Destiny lab module reading characters from an eye chart. Saint-Jacques then set up a virtual reality camera in the cupola, the station’s “window to the world.” The high-tech space footage will be used to create a short cinematic, immersive film for audiences on Earth. The CSA astronaut also activated a camera to capture imagery for the Meteor space-based observation study. The astronauts are also counting down to Sunday’s arrival of the first U.S. commercial crew vehicle on the SpaceX DM-1 mission. The uncrewed SpaceX Crew Dragon will launch from Kennedy Space Center at 2:49 a.m. EST Saturday. McClain and Saint-Jacques will greet the Crew Dragon after it docks to the Harmony module’s International Docking Adapter Sunday around 6 a.m.
Astronauts (from left) David Saint-Jacques and Anne McClain wear a head-mounted display for the Time Perception study which hypothesizes that crews underestimate the duration of time in space. The Expedition 58 crew explored how living in space impacts perception and psychology today. 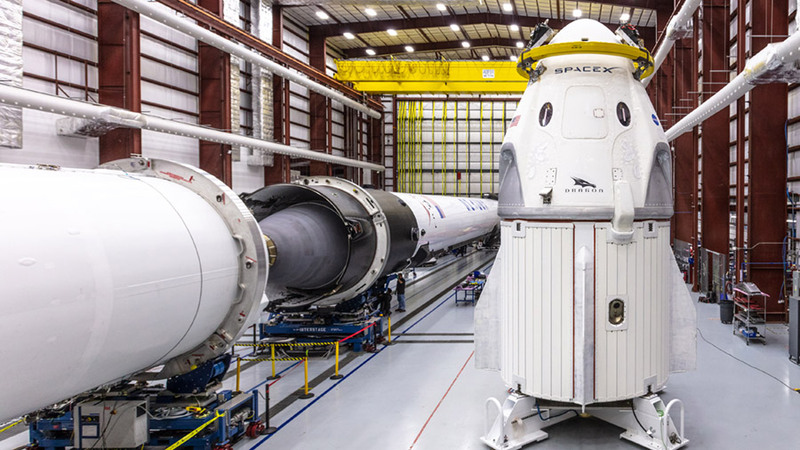 The trio also studied satellite navigation and continued reviewing this weekend’s arrival of the first SpaceX Crew Dragon spacecraft. Astronauts Anne McClain and David Saint-Jacques partnered up this morning inside Europe’s Columbus lab module for the Vection space perception experiment. 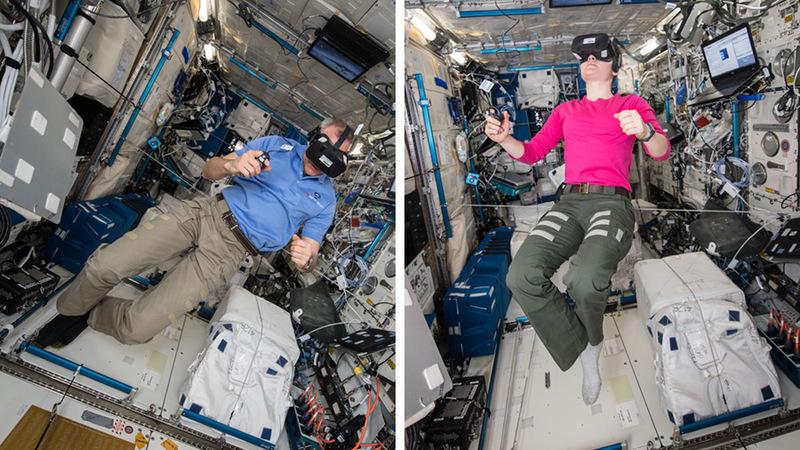 The duo wore virtual reality goggles, earplugs and a neck brace to study microgravity’s effect on the vestibular system. They took turns performing a series of tasks documenting perception of motion, orientation, height and depth. 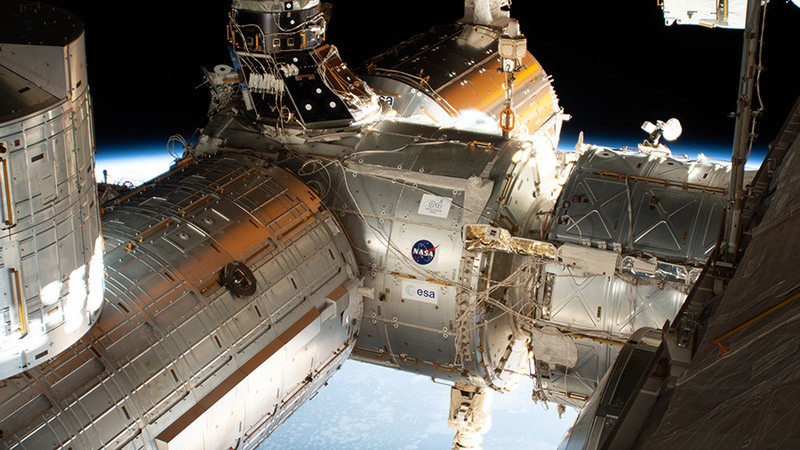 Results may improve astronaut training and the design of future space habitats. McClain then spent the rest of the day in the Japanese Kibo lab module operating a pair of tiny internal satellites for the SmoothNav study. The experiment is researching how autonomous satellites may benefit future public and private space exploration. Saint-Jacques went in to the afternoon reviewing rendezvous and docking operations when the uncrewed SpaceX DM-1 spacecraft arrives Sunday at 6 a.m. EST. He wrapped up his workday helping psychologists understand the adverse effects of living in space on an astronaut’s cognition and behavior. Commander Oleg Kononenko participated in a Russian cardiopulmonary study before installing communications gear in the Zvezda service module. In the afternoon, two-time station commander collected radiation readings and ensured the upkeep of Russian life support systems. 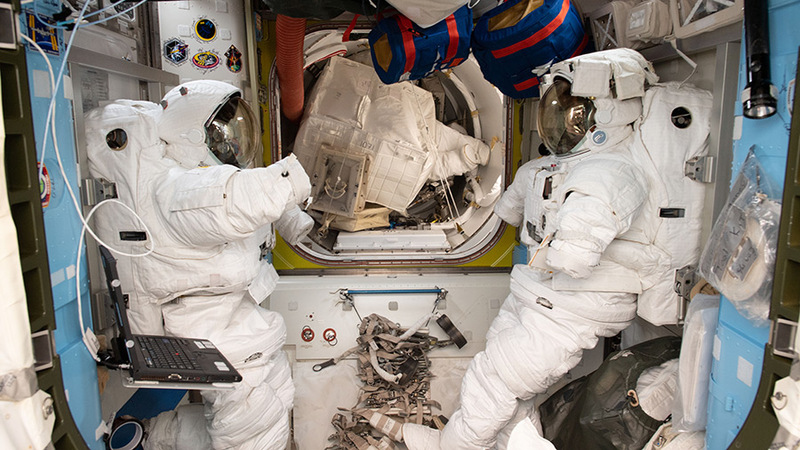 A pair of U.S. spacesuits are pictured during servicing work inside the Quest airlock where U.S. spacewalks are staged. Virtual reality filming and spacesuit cleaning highlighted the day aboard the International Space Station. The Expedition 58 crew also configured a diverse array of life science and physics hardware. NASA astronaut Anne McClain set up a virtual reality camera inside the Tranquility module after lunch today. She has been filming hours of footage this month depicting a first-person’s view of life throughout the station. The final film will be an immersive, cinematic experience to educate audiences on Earth about life in space. McClain started the day installing mouse habitat gear inside the Cell Biology Experiment Facility. The research device, located in Japan’s Kibo lab module, will house mice for an upcoming accelerated aging and disease study. Flight Engineer David Saint-Jacques was back on spacesuit duty today scrubbing cooling loops and checking the conductivity of water samples. The astronaut from the Canadian Space Agency also tested cables inside the Materials Science Research Rack. The refrigerator-sized rack explores chemical and thermal properties of materials such as metals, alloys and polymers to create new and improved elements and applications. 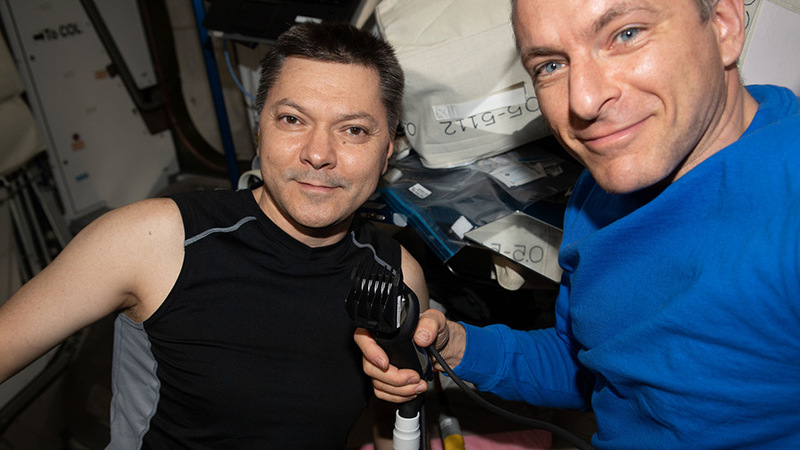 In the Russian segment of the orbital lab, Commander Oleg Kononenko worked on ventilation systems and collected air samples from the Zarya and Zvezda service modules. The veteran cosmonaut also photographed hardware for a blood pressure study and tested Earth observation techniques using a camera equipped with small ultrasound emitters. Back on Earth in Star City, Russia, three Expedition 59 crew members have wrapped up two days of classes and tests qualifying for their March 14 launch to the orbital lab. Commander Alexey Ovchinin and Flight Engineers Nick Hague and Christina Koch will end their stay at the Gagarin Cosmonaut Training Center on Feb. 26 and fly to the Baikonur Cosmodrome launch site in Kazakhstan. The trio will lift off inside the Soyuz MS-12 crew ship and take a six-hour ride to their new home in space. 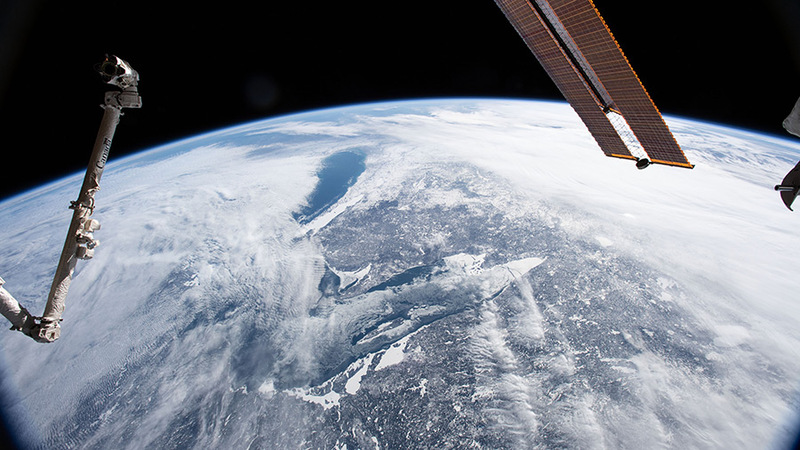 Lake Superior and Lake Michigan is surrounded by the cloudy and frozen terrain of the North American continent. Spacesuit servicing and high-temperature physics kept the crew busy today aboard the International Space Station. The Expedition 58 astronauts also researched meteorology from the station and explored more Earth phenomena from space. Astronaut David Saint-Jacques is returning a U.S. spacesuit to service today inside the U.S. Quest airlock. He verified successful installation of suit components and checked for water leaks in the suit at full operational pressure. NASA is planning a set of maintenance spacewalks at the station planned for March 22, 29, and April 8. 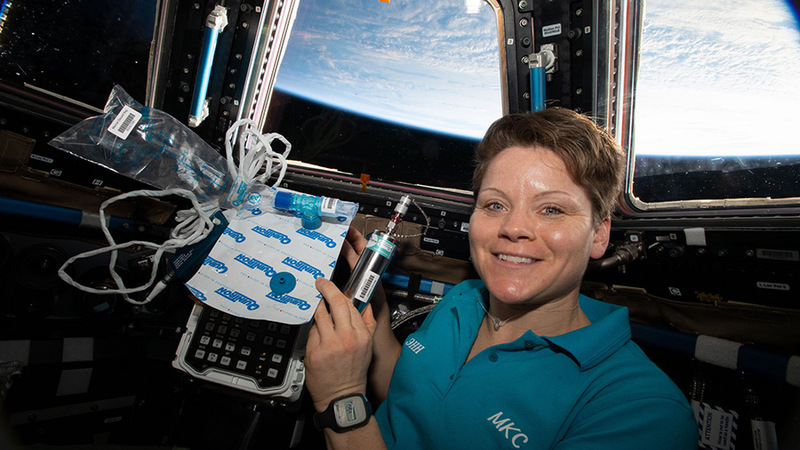 In the Kibo lab module from Japan, astronaut Anne McClain cleaned sample cartridges in a specialized thermo-physical research device called the Electrostatic Levitation Furnace. The high-temperature facility levitates, solidifies and melts samples that may contribute to the synthesis of new materials difficult to achieve on Earth. She later set up camera hardware for the Tropical Cyclone experiment to demonstrate storm predictions from the station. McClain targeted a moonlit Typhoon Oma today off the coast of Queensland, Australia from inside the cupola. Commander Oleg Kononenko worked on a suite of science experiments Wednesday in the Russian segment of the station. The veteran cosmonaut photographed terrestrial landmarks to document forest conditions and the effects of natural and man-made disasters. He also studied how space impacts the cardiovascular system and the piloting skills of a cosmonaut. Back on Earth, three Expedition 59 crew members are preparing for their March 14 launch to the orbital lab aboard the Soyuz MS-12 crew ship. 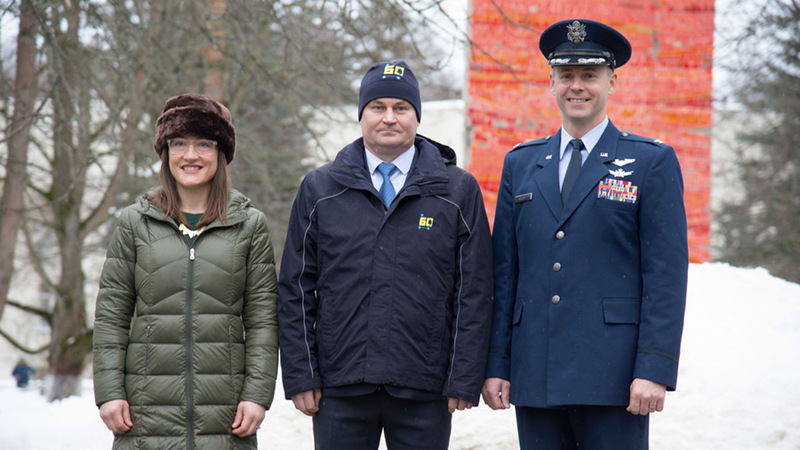 Commander Alexey Ovchinin and Flight Engineers Nick Hague and Christina Koch are in Star City, Russia for final training before heading to the Baikonur Cosmodrome launch site in Kazakhstan on Feb. 26. Expedition 58 Flight Engineer Anne McClain of NASA is pictured in the cupola holding biomedical gear for the Marrow experiment. The International Space Station is hosting a robotic experiment that may help enable and refuel future missions to the moon and Mars. The Expedition 58 crew installed that hardware today then worked on a variety of life science, astrophysics and combustion science gear. The Robotic Refueling Mission-3 (RRM3) experiment will demonstrate transferring and storing fuels and coolants such as liquid methane and a cryogenic fluid in space. Astronauts Anne McClain and David Saint-Jacques installed the RRM3 hardware today inside Japan’s Kibo lab module airlock. The gear will be deployed outside Kibo then transferred to an external logistics carrier. Once there, the Dextre “robotic hand” will begin operations demonstrating fluid transfers with a set of specialized tools. The two astronauts also split their time conducting maintenance on a pair of space incubators. McClain worked on a mouse habitat replacing filters inside Kibo’s Cell Biology Experiment Facility. Saint-Jacques swapped a carbon dioxide controller in the Space Automated Bioproduct Lab (SABL). SABL supports research into microorganisms, small animals, animal cells, tissue cultures and small plants. McClain also replaced a laptop computer hard drive dedicated to the Alpha Magnetic Spectrometer-2 experiment. The experiment is housed on the station’s truss structure and searches for antimatter and dark matter in addition to measuring cosmic rays. She later cleaned up gear supporting gaseous flame studies inside the Combustion Integrated Rack. Back on Earth, three Expedition 59 crew members are a month away from joining the three orbital residents aboard the space station. Commander Alexey Ovchinin and Flight Engineers Nick Hague and Christina Koch are in Star City, Russia in final training before their March 14 launch to the orbital lab. The forward end of the International Space Station is pictured showing portions of five modules. The Expedition 58 crew is helping scientists today understand how astronauts perceive time and orient themselves when living in space. The orbital residents are also working on CubeSat and free-flying robotics hardware aboard the International Space Station. Astronauts Anne McClain and David Saint-Jacques wore virtual reality gear for the Time Perception experiment sponsored by the European Space Agency. The study takes place in the Columbus lab module and is researching the hypothesis that time and depth perception are altered in microgravity. McClain of NASA started the day inside the Kibo lab module, opened the airlock and removed the CubeSat deployer. She disassembled and stowed the hardware in Kibo’s logistics module after it ejected a series of CubeSats into Earth orbit in January. Astrobee is a new experimental program that uses three small free-flying assistants and is due to begin operations soon. Saint-Jacques installed the Astrobee docking station in the Unity module where the cube-shaped robotic helpers will be able to attach themselves in the future. The autonomous free-flyers may be able to help astronauts with simple duties and enhance monitoring abilities on the orbital lab. Commander Oleg Kononenko spent Friday morning exploring how crew activities and the Earth’s magnetic field impact the structure of the space station. The experienced cosmonaut moved into the afternoon replacing dust filters before researching space navigation techniques. NASA astronaut Anne McClain works inside the Kibo laboratory module designed and built by the Japan Aerospace Exploration Agency. The three residents onboard the International Space Station today worked with a diverse array of science hardware. The trio continues to explore what living in space is doing to their bodies and helped scientists promote healthier humans in space and on Earth. Astronauts have reported increased head and eye pressure during long-duration space missions. The Expedition 58 crew is researching that phenomenon today to help doctors reverse the upward fluid shifts that affect space residents. One solution being studied is a special suit that draws fluids such as blood and water toward the lower body to prevent swelling in the face and elevated head and eye pressure. Astronaut Anne McClain tried that suit on today and Flight Engineer David Saint-Jacques used an ultrasound device to scan the activity. Commander Oleg Kononenko assisted the duo inside Russia’s Zvezda service module. Afterward, McClain glided to the opposite end of the station in Japan’s Kibo lab module to work on the Two-Phase Flow fluid physics experiment. 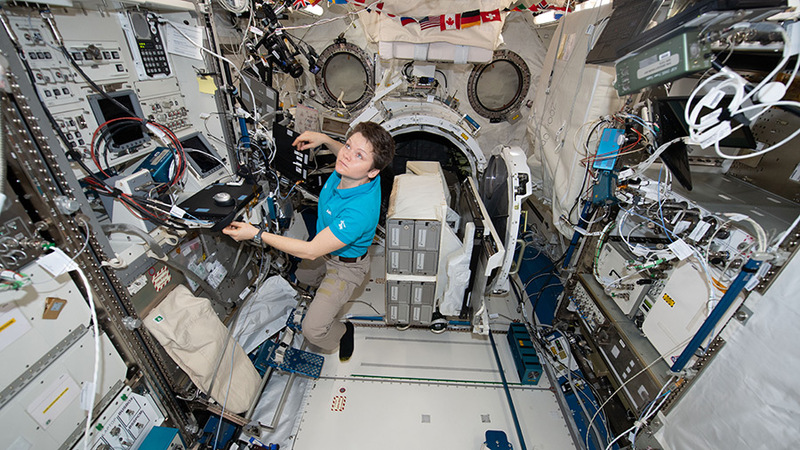 She set up and installed the research hardware inside Kibo’s Multi-purpose Small Research Rack. The experiment may enable engineers to design advanced thermal management systems for use on Earth and in space. Saint-Jacques returned to biomedical studies today collecting and stowing more breath, blood and urine samples for later analysis. The ongoing research is helping scientists understand the long-term space impacts to bone marrow, red blood cells and the overall human physiology. Saint-Jacques finally reviewed instructions to install a docking station on Friday for new cube-shaped, free-flying robots that will arrive at the station later this year. The Astrobee autonomous assistants may free up more science time for astronauts and allow mission controllers better monitoring capabilities. Astronaut David Saint-Jacques (right) of the Canadian Space Agency becomes a barber aboard the International Space Station and trims Expedition 58 Commander Oleg Kononenko’s hair with clippers attached to a vacuum hose. NASA astronaut Anne McClain spent all day setting up cooling gear inside the U.S. Destiny lab module and Japan’s Kibo lab module. She drained and refilled water pumps inside the Fluid System Servicer and the Internal Thermal Control System. The life support systems help cool the station’s atmosphere and dispel heat generated by electrical systems. Microgravity’s impact on the human physiology was the focus of Flight Engineer David Saint-Jacques’ day. The Canadian Space Agency astronaut collected and stowed his breath, blood and urine samples for a variety of human research experiments. The research is supporting the long term-collection of human biological samples and observing bone marrow and blood changes. Saint-Jacques also conducted ultrasound scans in the Zvezda service module for the Fluid Shifts study with assistance from Commander Oleg Kononenko and doctors on the ground. That research is seeking to reverse increased head and eye pressure that occurs in space. Kononenko started Wednesday servicing Russian life support systems. The four-time station resident then spent the afternoon on more space research studying motion coordination, radiation exposure and crew psychology. NASA astronaut Anne McClain is surrounded by exercise gear, including laptop computers and sensors that measure physical exertion and aerobic capacity, during a workout session. The Expedition 58 crew explored space exercise and checked out biology hardware today aboard the International Space Station. The space residents supplemented their research activities and kept the orbital lab systems in tip-top shape. Daily exercise in space is important so astronauts can fight muscle and bone loss caused by living in weightlessness. Doctors are seeking to optimize workouts for crews to stay in shape for strenuous activities like spacewalks, returning to Earth and adjusting to gravity. Anne McClain of NASA contributed to that research today strapping into an exercise bike while attached to breathing tubes and sensors. 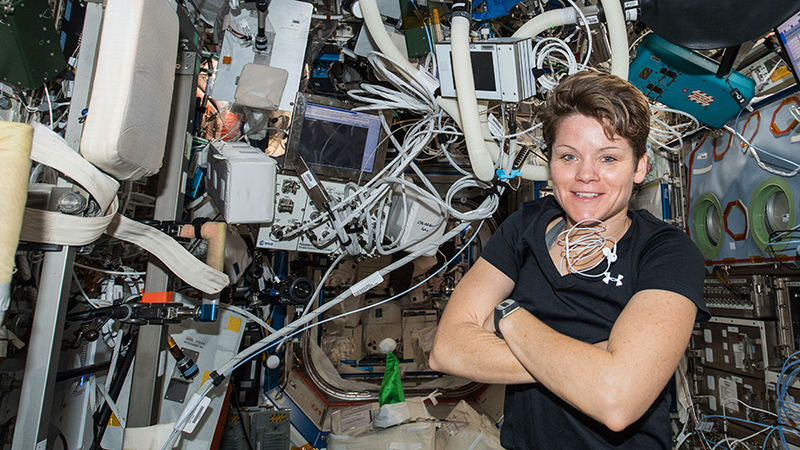 Scientists measured her breathing and aerobic capacity to understand the effects of microgravity on pulmonary function and physical exertion. Canadian Space Agency astronaut David Saint-Jacques worked on a pair of incubators throughout Tuesday. He disconnected hardware in the Kubik incubator that houses small biology studies in the Columbus lab module. Afterward, he glided into the Kibo lab module and set up a carbon dioxide meter inside the Space Automated Bioproduct Laboratory supporting a wide variety of life sciences. The commander, Oleg Kononenko of Roscosmos, worked primarily in the station’s Russian segment beginning the day working on life support gear. The highly experienced cosmonaut then moved onto space navigation research before charging the emergency phone inside the Soyuz MS-11 spacecraft.